Fall is a wonderful time of year to get things done around the house. With the workweek behind, Saturday morning is the perfect place to start. Hanging on the refrigerator or sitting on the counter in the laundry room is sure to be your to-do list. It might include tasks like raking leaves, cleaning out the garage, and fixing the screen door. Nothing earth shattering, but all stuff that needs to get done. Unfortunately, many strategic plans I review this time of year look eerily similar to the Saturday to-do list. They’re filled with lots of ordinary tasks, but nothing that will truly differentiate them in the market. These ordinary tasks, things like creating a new social media marketing campaign or filling vacancies in open sales territories, are referred to as operational effectiveness (OE). OE consists of similar activities performed in similar ways to those of other players in your market. These tasks are important antes to keep you in the game, but won’t win the game. Strategy on the other hand, consists of those activities that are different from competitors (e.g., Netflix making movies available online) or similar activities done differently than the competition (e.g., Enterprise Rent-A-Car renting cars by picking you up instead of you going to them). Strategies are designed to help you win the game. Now take a look at your strategies. Do they more closely resemble tasks on your Saturday to-do list or are they innovative game-changers? If your strategies are closer to cleaning the garage than creating competitive advantage, consider these three techniques to change your business destiny. 1. Create an innovation mindset. A recent study of more than 12,000 sales professionals and 2,500 sales managers found that the number one skill contributing to world-class sales manager performance is innovation. In its simplest form, innovation is the ability to create new value for customers. This new value is built on a familiar, but often misunderstood, term: insight. Insight comes from a managers ability to connect the dots–to connect information or data together in a unique way to come up with a new approach, new solution or new way to bring value to the customer. 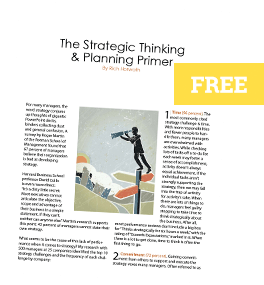 There are roughly sixty strategic thinking exercises you can use to begin developing an innovative mindset for your managers. One such exercise is the design of a Contextual Radar, which visually highlights the key factors in the areas of market, customers, competitors and company. 2. Smash the Silos. Silos are for missiles and corn, not strategy. Many organizations have silos that separate their best people and ideas from one another like cinder block walls. Great leaders understand the need to coalesce, or bring together, people and ideas on a regular basis. Facilitating regular conversations with key people from your team and other areas is one way to transform strategy from an annual event into an ongoing dialogue about the important business issues. If these periodic conversations are framed with the right questions and exercises, they will lead to winning strategies. In one organization where I facilitated quarterly strategic thinking workshops, a conversation generated an insight that led to a $100 million new product three years later. Insights like that can buy you a whole lot of corn and a bunch of missiles to boot. 3. Ditch the “Strategy Meal”. A tacit comment from many business people is “Strategy’s not my job. That’s for the higher ups.” This mindset is prevalent for several reasons. One is that more than 90 percent of people have had no training on strategy, so how in the world can they be expected to contribute to it? The second is that in many organizations, strategy is an event that happens once a year, kind of like a birthday. Think of any activity–golf, tennis, chess, playing the piano–if you only do it once a year, how good will you realistically become? And third, strategy is often given to people from the CEO or brand manager, so they assume that it’s their strategy too. Wrong. Strategies have to be crafted and translated to people’s specific roles so that they understand how to use their resources–time, talent and budget–to implement them. In some cases, strategic plans are housed in software systems, where pre-packaged strategies have already been populated into drop-down menus for the person to select from, kind of like a kid choosing what toy they want in their Happy Meal. While “Strategy Meals” might be convenient time savers, they’ll most likely leave you hungry for a more relevant and effective plan. As the reddish-yellow leaves fall and jack-o’-lanterns start to fill the night sky with flickers of light, it’s a good time to review your strategies. Are they a to-do list of tactics or a roadmap for winning business in your market?